Today we arrived at our friend's (Anne and Victor) hanger at the Hanover Airport just outside of Hanover. We have landed here for an undetermined period of time as we have volunteered our services as they are in the process of having a house built. Yes, they have hired a contractor but are supplying some of the sub-contractors so they are actively involved in the day by day construction process. Anne and I are keeping busy trying to clean up some bush that will someday be part of the yard and Ed is helping to pull wire for the electrictian. It's sad that our trip has ended but good to see friends and family again. As always we'll start planning the next trip soon --- the snow will fly before we know it and we'll want to be somewhere warmer. We've driven through Sault Ste. Marie before but had not stopped and looked at the city, so we decided to spend a day here checking the place out. 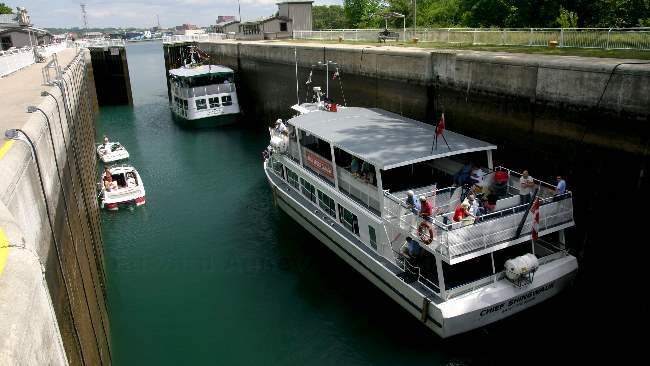 The Locks on the Canadian side are only used for pleasure boats these days. A number of years ago the lock walls started to collapse and in repairing it the lock was reduced in width by 3 meter. They also added new gates which decreased the length. In the downtown area there is a boardwalk that runs along the waterfront. A boat coming into the Canadian locks. Zaph got lots of hugs from 13 month old Aiden. 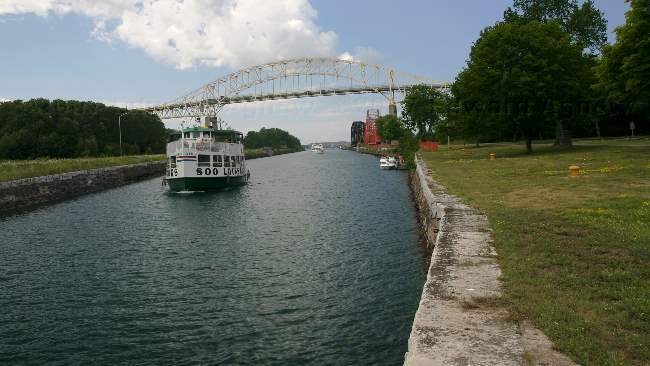 Boats going through the locks. Zaph clowning around with some of the locals. 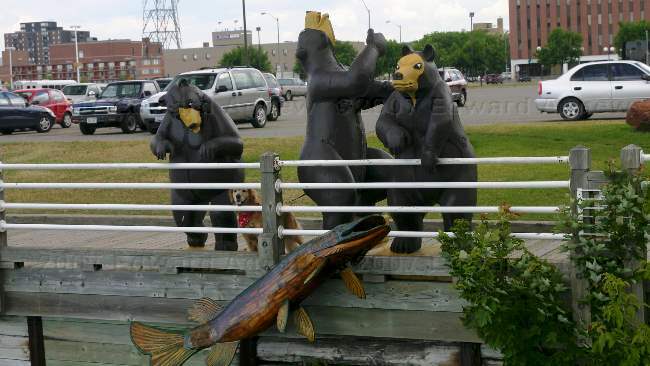 As we head east we know we have definitely left the prairies behind ---- we drive past lots and lots of trees, rivers and lakes as we drive through Minnesota and Wisconsin. On the 26th we head into the upper Michigan peninsula stopping at Marquette for the night. 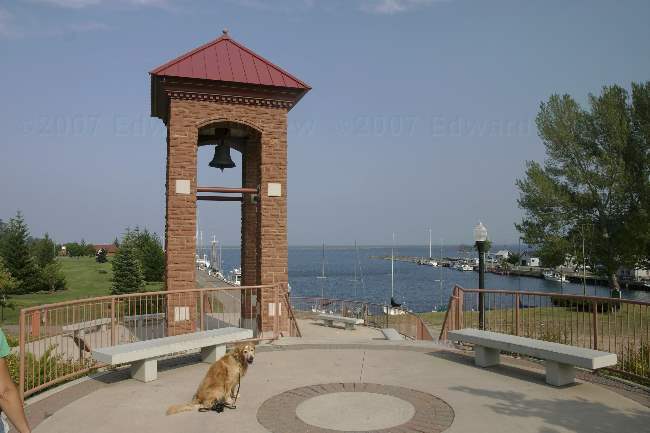 We've stopped early enough that we have time to drive around Marquette and check the town out. In the misty morning of the 27th we drove along the lake away from town to see what that area was like. In the afternoon, we were on the road again heading to Sault Ste. Marie and Ontario. 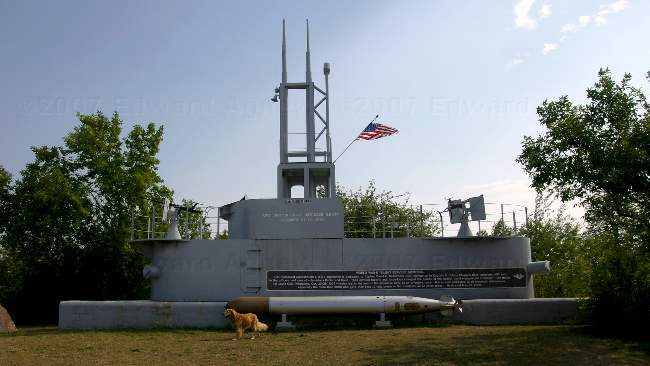 Zaph in front of the memorial to seamen. A view of the harbor. The bell is from the original fire station that was built in the 1880's. 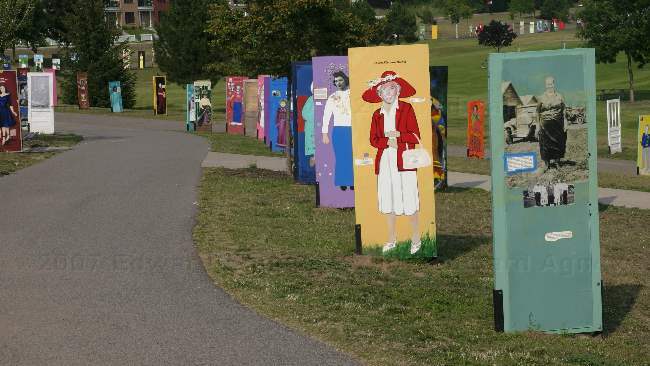 The bike paths at the harbor park were lined with over two hundred doors in the exhibit --- "Grandma Doors". Artists decorated their doors honoring their grandmothers. 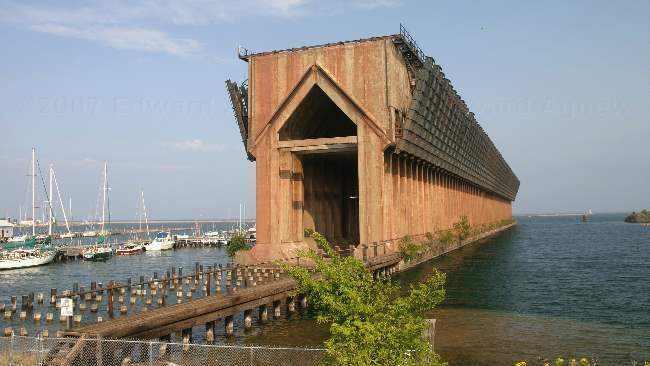 An out of use ore dock. 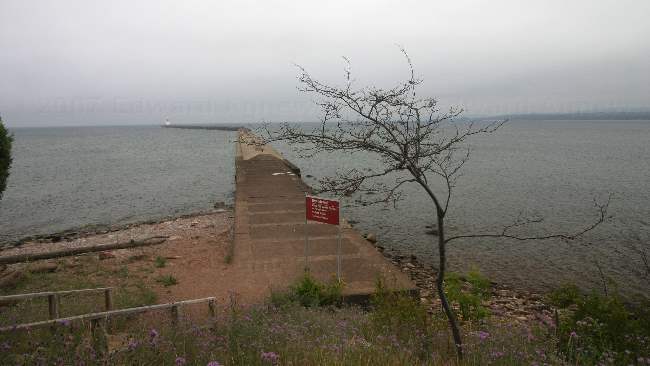 A breakwater --- it was quite misty so you can hardly see the lighthouse at the end of the breakwater. We continue driving east and see more corn fields. About a third of the way across Minnesota we turn right and start heading south. 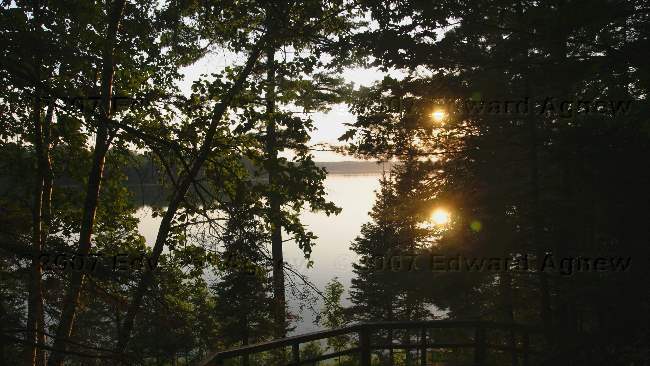 Ed had read about Itasca State Park in Minnesota and decided that we should drive the 25 miles to visit the park. As we head south we start to see more trees and more water .... Minnesota is after all the land of a thousand lakes. 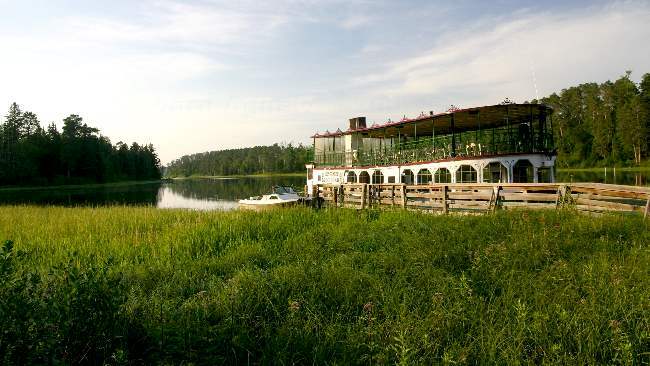 Itasca is Minnesota's oldest state park --- the park totals more than 32,000 acres and includes more than 100 lakes. 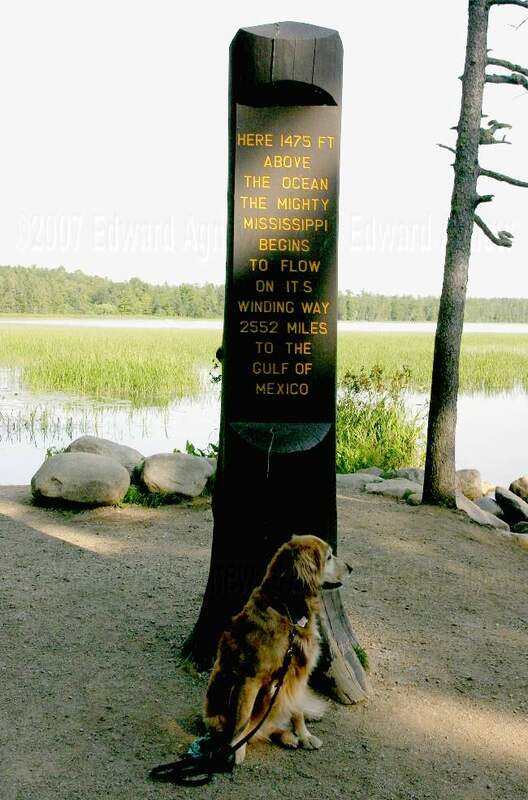 Itasca Lake is the source of the Mississippi River. As it is still very hot we decide to stay here for 2 nights. Zaph is having a hard time focusing on getting his photo taken as the water is only 10 feet away. Ed and Zaph walked across the Mississippi River. Zaph and I walked it as well! 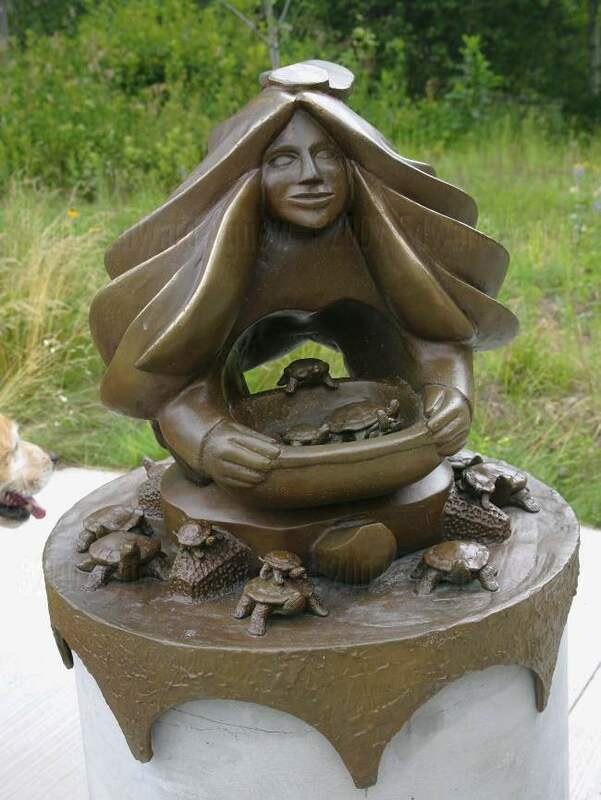 Heartwaters - Caretaker Woman to watch over Mississippi headwaters. 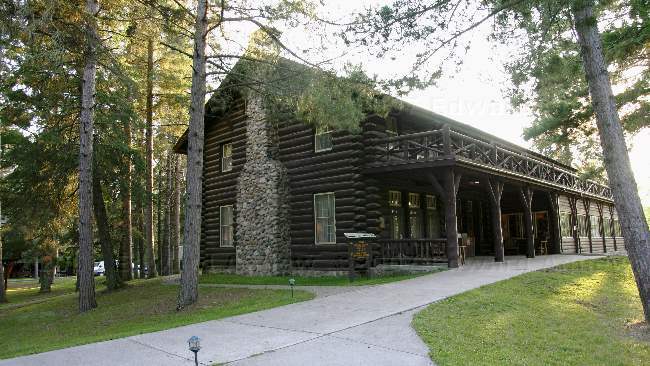 The Douglas Lodge was built in 1905. This boat will take you around the lake from the lodge to the headwaters. The sun was starting to set and reflected nicely off the lake. Leaving Minot we continue east on highway 2. We're still seeing hay fields but now and then corn fields appear. 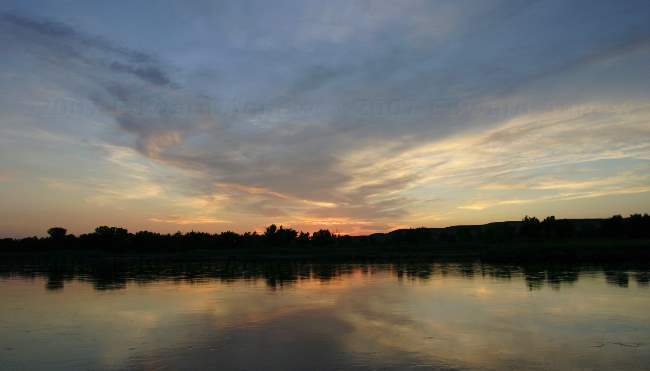 Tonights stop is Turtle River State Park in North Dakota (about 20 miles west of the Minnesota state line). As it's late Sunday afternoon the park is pretty quiet. The temperature is in the 90sF so we join the majority of people in the park at the river. Highway 2 passes through the geographical center of North America. Zaph is waiting for a stone to be thrown --- he swims to the spot where the stone hit the water. 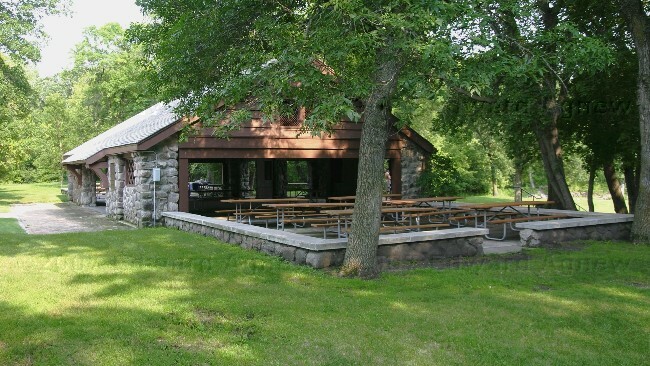 This beautiful stone and log structure is a picnic pavilion that was built in the 1930's by the CCC (Civilian Conservation Corp). We've started the journey east towards Ontario and home. After some debate we decided to drive highway 2 across the northern states to Michigan and will cross into Ontario at Sault Ste. Marie. We crossed into Montana at the Wildhorse border crossing where for the first time the boxes in the truck were opened and so was the cargo bay. Yeah, the fridge and freezer were also checked for beef and fruits and vegetables. The border guard got the same answer I get when he asked the question I always ask "Why so many tools? Ed's answer is "I like tools". The first day we drove from Havre, Montana to Glasgow, Montana past lots and lots and lots of hay fields. The second day we drove from Glasgow to Minot, North Dakota and saw more hay fields though we did see a bit of "bad lands" when we crossed into North Dakota (we were about 100 kms north of the official North Dakota bad lands). When we arrived in Minot we had trouble finding a campsite --- the first two campgrounds were full and luckily the third one had 3 - 20 amp electric sites left. As it's been in the mid to high 90'sF we really wanted to be able to turn the air conditioner on so we took one of the sites (the air conditioner needs 15 amps to run). When our neighbors arrived we explained we were passing through and wondered why it was so busy in the campgrounds .... they laughed and said it was the first weekend of the state fair and we were lucky to find a campsite. Hearing about the state fair and never having been to one we decided to see if we could stay another night. We could so it was off to the fair on Saturday. The fair was pretty big .... we certainly didn't manage to see it all and it reminded us of the Toronto CNE back in the olden days (the late 60's). Count 'em .... 12 wheels ---- OK you can only see 6 wheels but there are 6 more on the other side. That's Ed (in the cab) playing in a big boy toy. Ride 'em cowboy ....interesting choice for a horse. Give daddy a big hug. These tigers were born in captivity and have had human contact each and every day. The Marcan Tiger Preserve is located in the Panhandle in Florida. Each summer some of the Bengal Tigers go on the road to promote the preserve. To keep the tigers stimulated and thus "happy" they are trained to do certain behaviors on command. The air conditioned arena hosted several equine events with lots of other events scheduled over the duration of the fair. Snort rolling the barrel across the stage. Nellie --- the world's smartest pig. These 3 pigs are part of Valentines Performing Pigs. 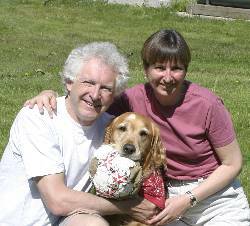 Nellie has been on TV a number of times including Letterman, the Tonight Show and Animal Planet. The midway. They had a ride I haven't seen been before ---- two people are strapped into an orb and flung into the air similar to a sling shot action. Lots of screaming and interesting words from that ride! On our travels we met several people from Medicine Hat. 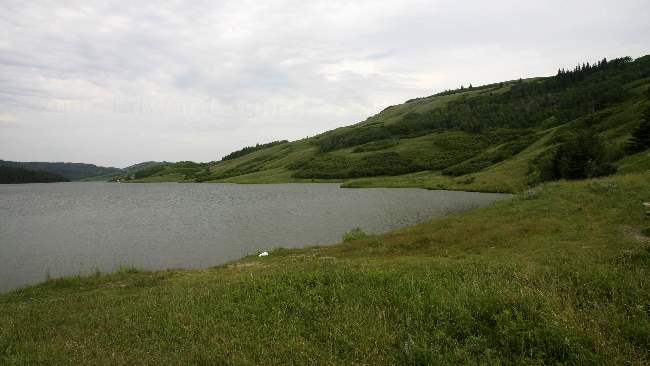 When asked what we should see in the area the response was always Cypress Hills Provincial Park, which is about an hour south west of Medicine Hat. As it was on our way, we stopped to see if we could get a site. We could, so we decided to stay for 2 nights much to the delight of Zaph as there was a lake just made for swimming. The park is quite large with much of the activity centered around the "town site" and lake though there are several other lakes and campgrounds in the park. 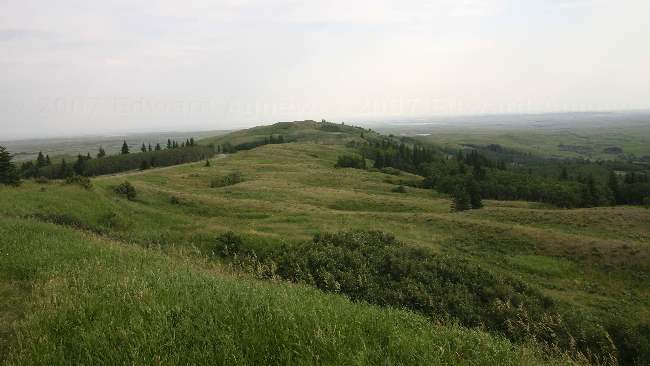 One of the "hills" of Cypress Hills. 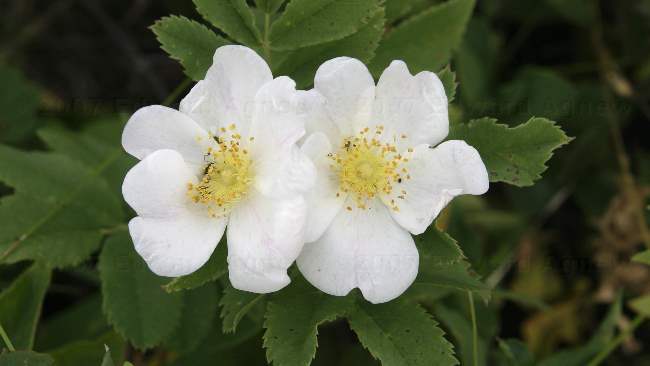 Some of Alberta's wild roses. One of the lakes --- Zaph said the lake was fine for swimming. The nice thing about provincial parks is the 2:00pm check out. That gave us time to take a bus tour into the Natural Preserve. The bus tour stopped at several spots that the hike did not cover and the interpreter, bus driver, etc. was very informative. Leaving Dinosaur Provincial Park we headed to Medicine Hat where the truck was given a much needed oil change. 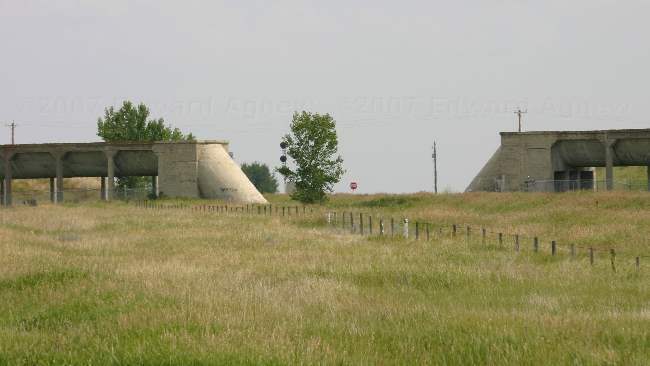 On the way to Medicine Hat we stopped at the Brooks Aqueduct that CP railway built around 1914 to provide water for south eastern Alberta. The aqueduct was used till the 1960s when it was replaced by a canal. The aqueduct went underground to cross the railway tracks --- they didn't want to take the chance of the aqueduct collapsing 0n the tracks. 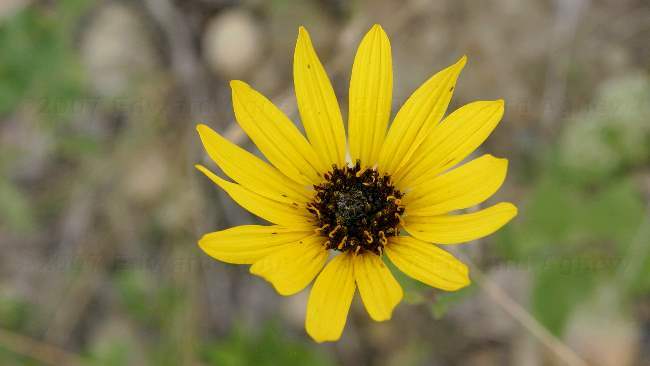 We signed up for the "Great Badlands" hike, a 3 hour guided hike in natural preserve portion of Dinosaur Provincial Park. The hike took us to some areas where we found pieces of bones lying on the ground, walked on some "jelly" mud and saw some great view. You can imagine the quantity of bones that is in the park if pieces (insignificant as they are) are left lying around (I think the paleontologists had completed their work in the areas we were). The paleontologists are interested in complete or mostly complete skeletons and in bone beds (lots of large bones found together). This was the only climbing we did on our hike. I find the badlands to be incredibly beautiful. A view in the "valley of the castles". Glass Tiger shot part of a music video "Diamond Sun" here. A hoodoo in the foreground. This is a vertebrae that was just lying on the ground. Those log like rocks in the middle of the photo aren't rocks .... they're petrified wood. You could see the base of the tree further up the hill. This is the famous camel hoodoo with a pyramid in the background. We heard a lot of bad hoodoo jokes like this one "what do you call a hoodoo with a bush growing out of the top of it" --- "a hair doo"!!!! Each evening at the park we attended "the show" at the amphitheater. The park interpreters wrote shows that related to the park and preformed them with volunteers from the audience --- they have some great imaginations. 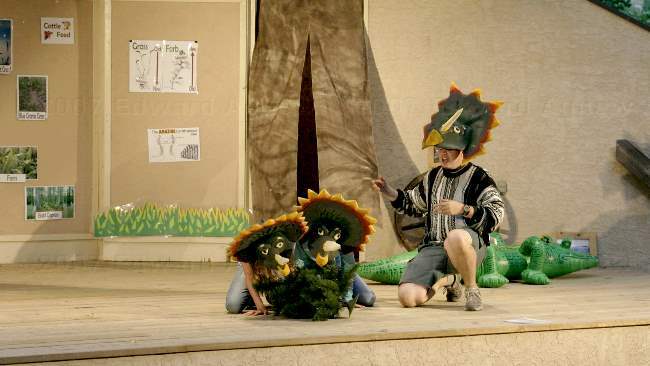 Kyle managed to find himself two great dinosaurs who got right into their roles tonight. 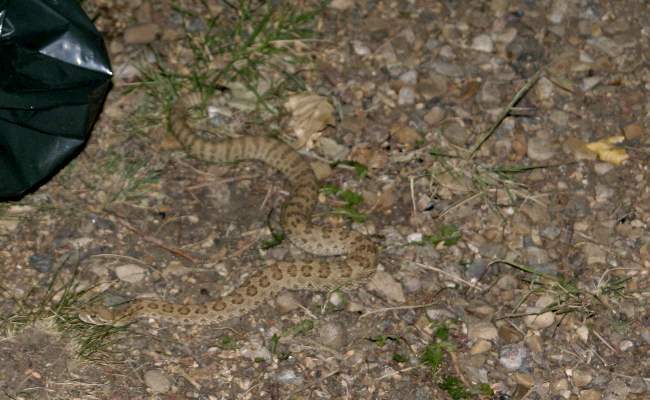 This rattlesnake was found outside our neighboring trailer at 10:30 pm one evening --- I wasn't impressed. We decided to start by exploring the public section of the park, there are several hikes, a great view point and some fossil exhibits. The highs are currently in the mid 30's C so we started early planning on some siesta time in the afternoon. Most of the rock here is sandstone which is easily eroded but there are also layers of iron stone. Iron stone is much harder than sandstone and thus does not erode as quickly causing some of the beautiful formations. This exhibit is found at one of the trail heads. 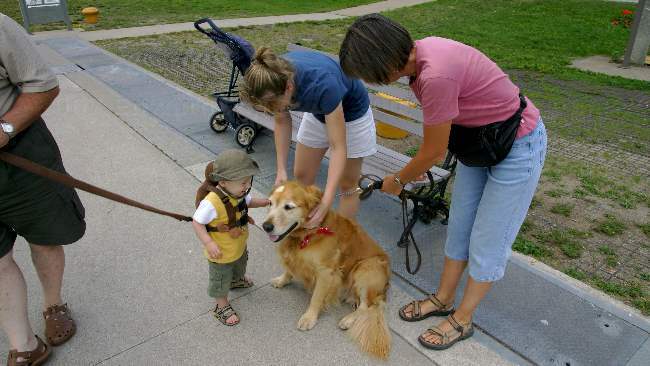 Occasionally, bones are left in place for public viewing (the bones would be from a commonly found dinosaur). 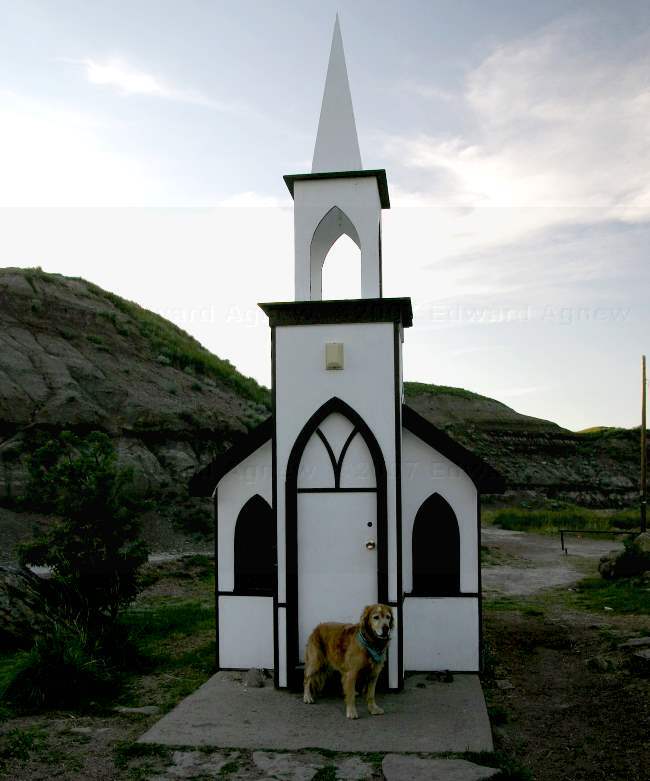 A building is erected over the bones to protect them from the elements. 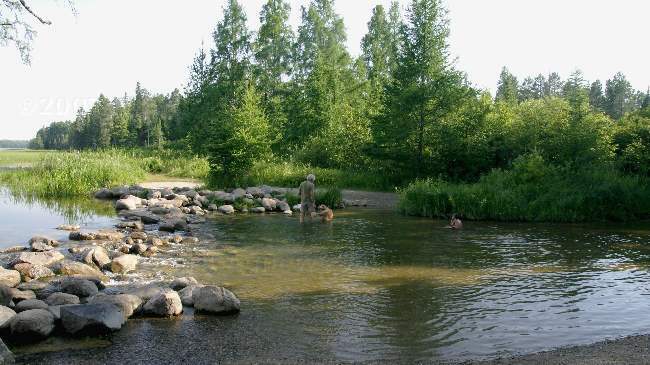 The Red Deer River creates a Riparian environment. This Cottonwood Tree is over 200 years old. The bones that are found in Dinosaur Provincial Park are taken to the Royal Tyrrell Museum for study. The information center at the park is also a Field Station for the museum. 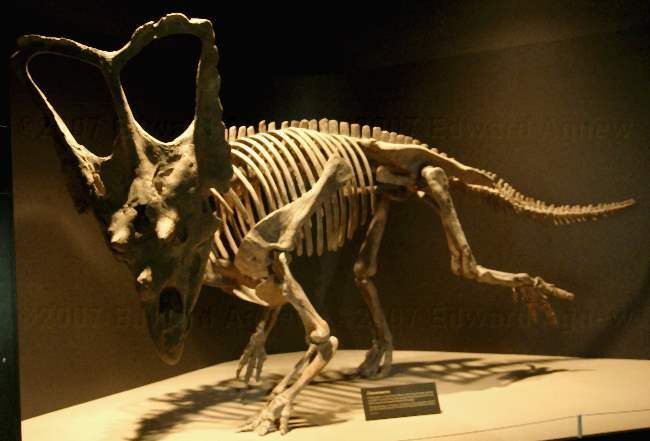 This guy is a Chasmosaurus or open lizard. A Glyphstone. Natives are thought to have recorded information on stones though the meaning has been lost. Time to leave Drumheller and move to Dinosaur Provincial Park, the place where the majority of Alberta's dinosaurs have been found. 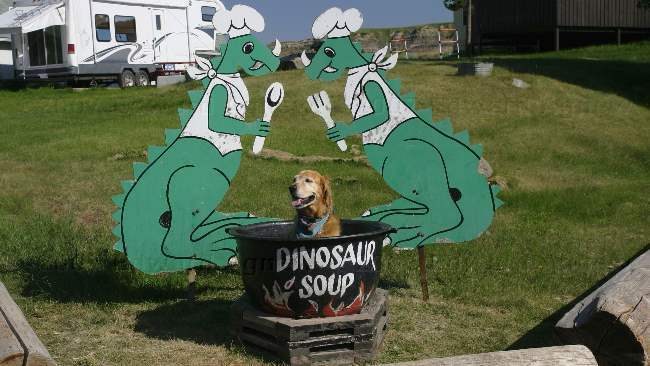 "In addition to its particularly beautiful scenery, Dinosaur Provincial Park – located at the heart of the province of Alberta's badlands – contains some of the most important fossil discoveries ever made from the 'Age of Reptiles', in particular about 35 species of dinosaur, dating back some 75 million years." (borrowed from a UNESCO World Heritage website). A section of the park is open to the public for camping and hiking while the remaining portion (most of it) is set aside as a Nature Reserve that is only accessible by permit or if you are on a tour. Paleontologists continue to visit the park each summer looking for more bones and fossils, I was told that there are ten active dig sites this year. Sunset at Dinosaur Provincial Park. The Royal Tyrrell Museum of Palaeontology is a world renowned museum that hosts the world's largest collection of dinosaur fossils under one roof and since we are in Drumheller we need to visit it (actually it was one of the reasons we decided to visit Drumheller). Ed and I were impressed with the museum and exhibits. 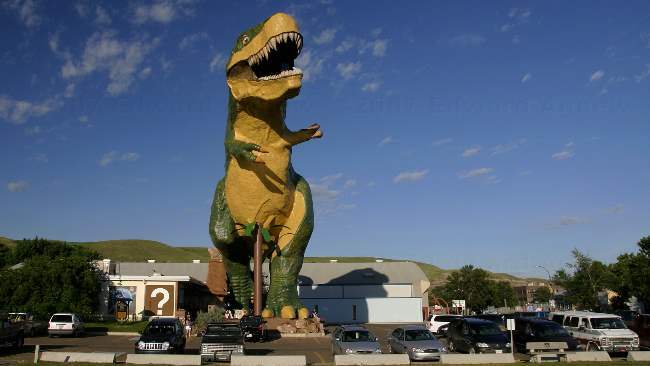 If you're into dinosaurs this is place you need to visit. A Tyrannosaurus Rex --- I wouldn't want to meet this guy while I was out for a walk. This is what they think a giant Beaver would have been like. Can you imagine the size of trees he could have taken down? Luckily this mock up of the first oceans is 12 times the original size. The floor was glass so it looked like you were walking over many of the sea creatures. Ed was fascinated by the idea that the T. Rex is related to today's chicken. The idea makes you look at chicken differently. A pair of Dimetrodon bask in the Permian sunlight. A Mammoth being attacked by a "cats". We spent the day touring around the Drumheller area enjoying the badlands. We celebrated Zaph's birthday today, so we stopped for ice cream (he shared my blizzard) and picked up a steak for Ed and Zaph to share at dinner --- pretty lucky puppy. Zaph and I enjoying a view of Horsethief Canyon. 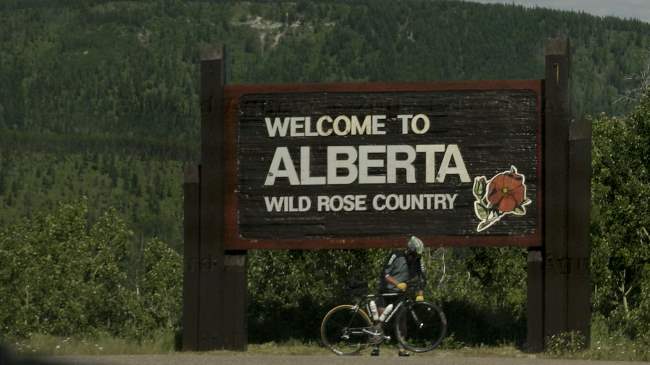 As you drive through this part of Alberta you see lush green fields and bright yellow fields. The yellow fields are Canola in bloom. I like the double oil connotation of this photo. Another view of the fields. The Red Deer River is the split between the two fields. The Bleriot Ferry --- one of only seven remaining cable ferries in Alberta. The operator must go back and forth across the river hundreds of times a day taking one or two cars at a time (the ferry can hold 15 cars). Looking down at the Red Deer River from the Orkney viewpoint. If you looked straight down you got a great view of old appliances that had been dumped. The Rosedale Suspension Bridge. There were no sides when the miners used it. Looking down on the Rosedale Suspension Bridge. 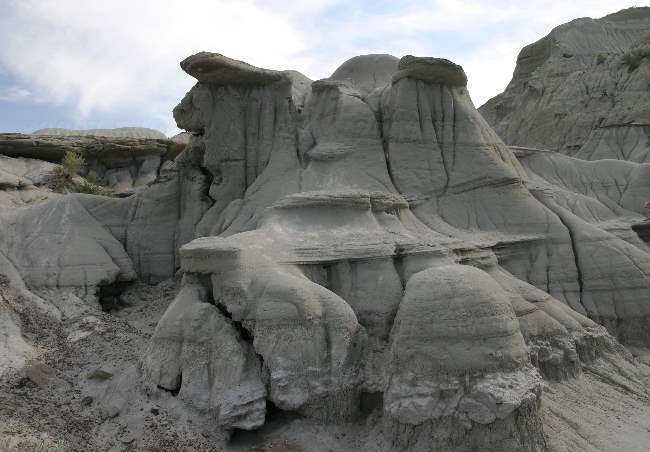 These "Hoodoos" are less than 20 feet tall and are continuing to erode. A coal saw at the Historic Atlas Coal Mine. One of the few remaining tipples at the Historic Atlas Coal Mine. A view of Horseshoe Canyon. 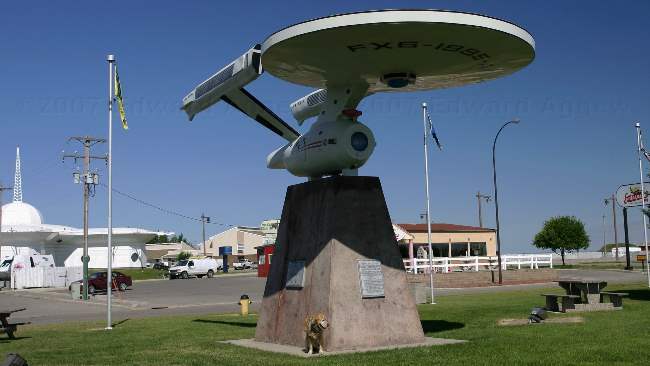 We continue our drive north and pass a town where Ed insists we stop --- any good trekie would. 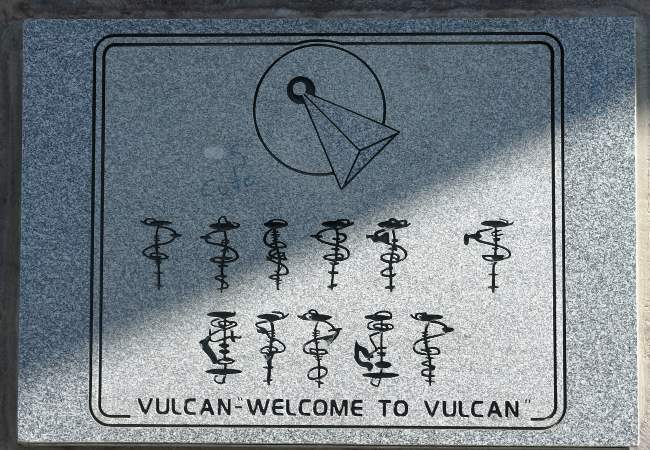 The town is Vulcan and no it wasn't named for Spok's home planet but for the Greek God of Fire (the town sign said Greek God but the internet says Vulcan is a Roman God). Leaving Vulcan we head back into time .... way back .... to the age of the dinosaur .... oh wait a moment we didn't go back in time we just arrived in Drumheller. The town has really taken the dinosaur theme to heart, there are models of dinosaurs throughout the town and murals of dinosaurs on a lot of the buildings. Zaph's hoping that Scotty won't beam him up. 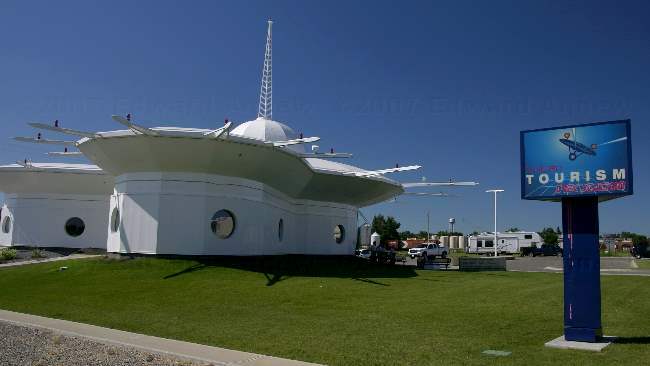 The tourist information center and yes they do have stars from Star Trek come to visit. The giant dinosaur at the tourist information center. The artwork for Head-Smashed-In Buffalo Jump says it all. 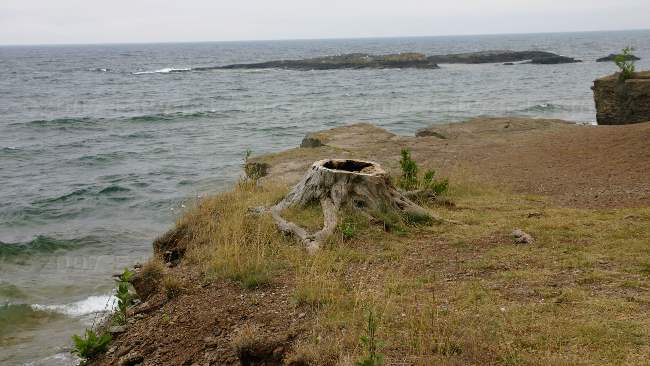 This is a spot, where for thousands of years, the natives maneuvered herds of buffalo over a cliff edge. A successful jump would provide food, hides and other necessities for several months if not for a winter for an entire tribe. We think this is a falcon. There was a marmot lying on the cliff edge sunning when this guy flew over and decided the marmot looked tasty --- I think the marmot was as large as the bird. The bird dove at the marmot a couple of times before the marmot decided to evacuate the area. "The cliff" at the buffalo jump. Over the thousands of years the cliff was used the land below the cliff has slowly risen .... in part due to the bones left piled at the bottom of the cliff. The interpretive center building is a work of art and literally blends in with the landscape --- a portion of the building is actually underground. 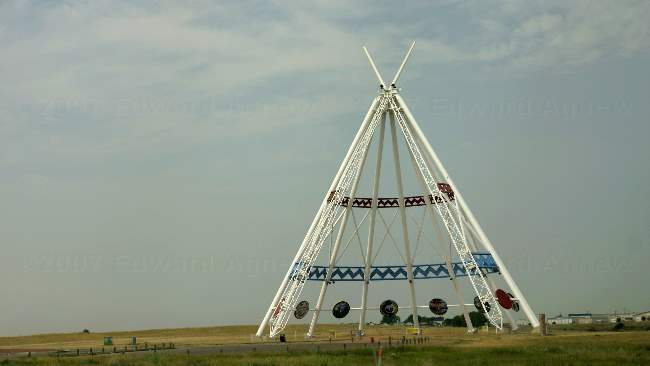 Today we left Waterton Lakes National Park and ended up in Fort Macleod as we thought we should visit "Head-Smashed-In Buffalo Jump", a UNESCO world heritage site. 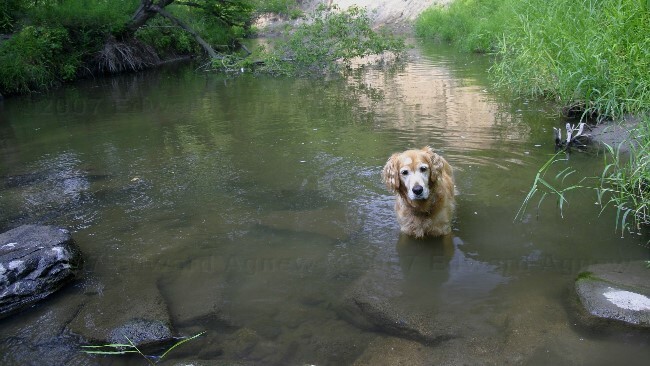 Zaph thought the RV park was great as it backed onto a river and he was allowed to swim in it. 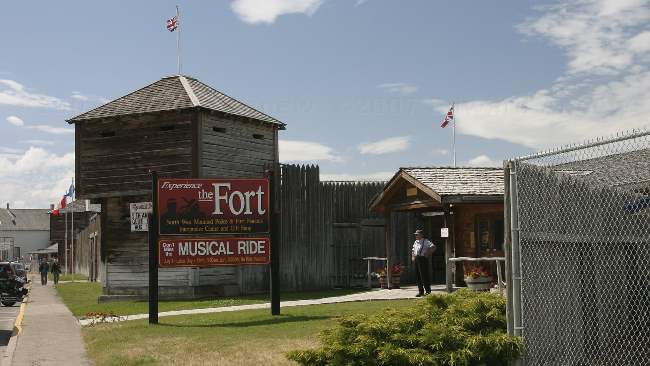 Fort Macleod is known for it's Mounted Police fort. 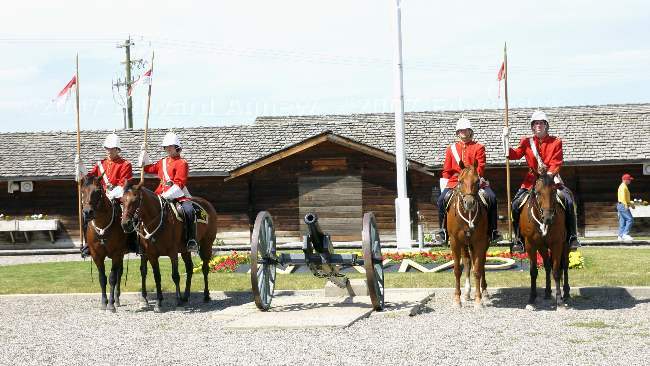 As we had Zaph with us, we didn't go in but did watch the Musical Ride. 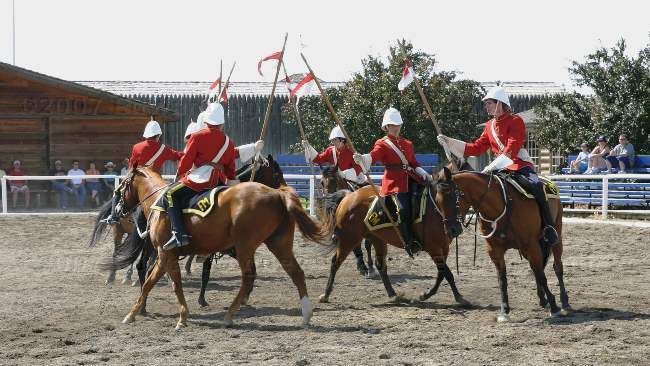 Four of the mounties ready to begin there ride. One of the maneuvers was riding in a tight circle. We were very happy to wake up and see clouds and cooler temperatures --- I think that was a first for me, but it's a nice break from the unrelenting sun and heat over the past couple of days. I don't know how people are surviving in the heat wave currently hitting the south west of the US. 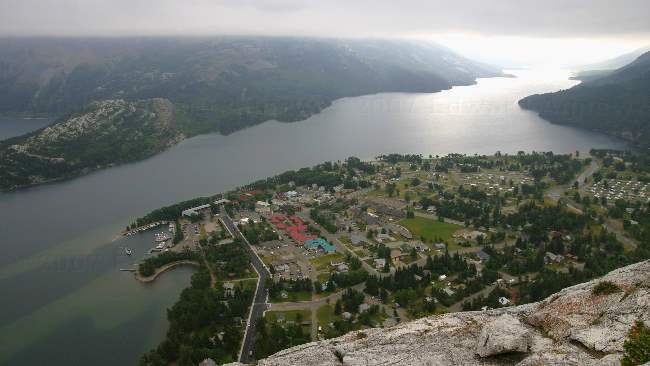 The day started with a hike up to Bear Hump, a view point over looking the town site and then a drive to Cameron Lake. The town site from Bear Hump. 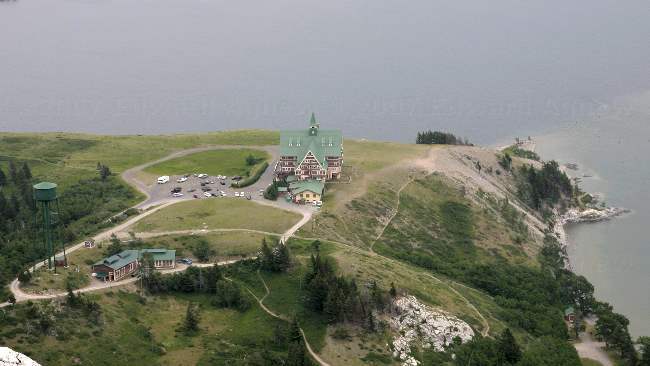 The Prince of Wales hotel from Bear Hump. 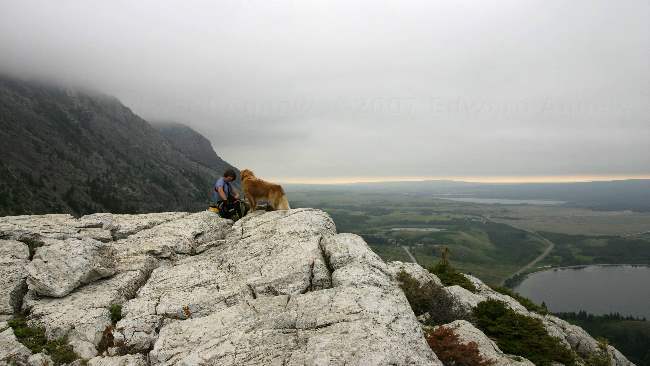 Zaph and I on Bear Hump. 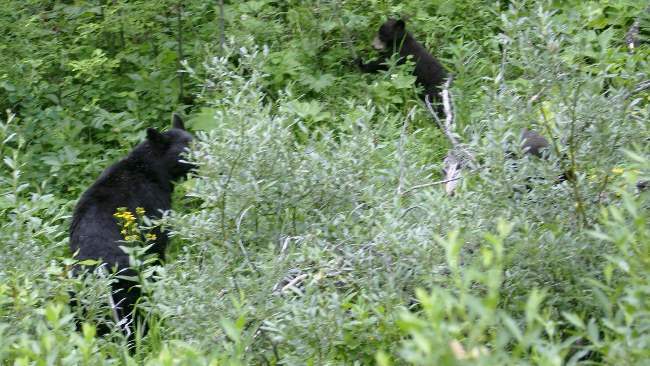 On the drive to Cameron Lake we came across some stopped cars --- they had spotted a black bear with two cubs. 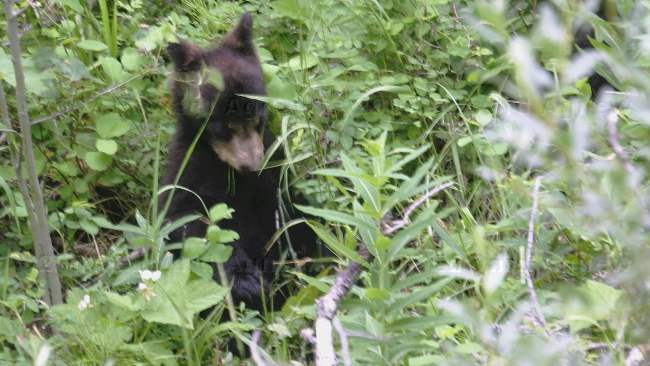 A closer view of one of the cubs. 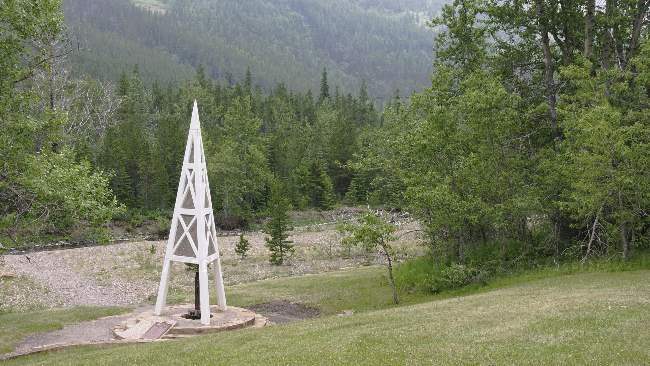 The first discovery of oil in the Canadian west was made here at Waterton National Park. We started the day with a cruise down Upper Waterton Lake crossing back into Montana. 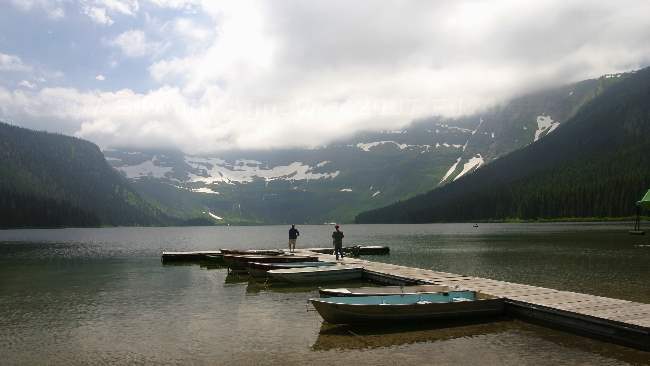 The boat stops at Goat Haunt Montana dropping hikers off before returning to Waterton. The rangers get to be border guards and check passports. After returning to town we managed one hike before the heat got to us. The rest of the afternoon was spent hanging out by the lake. Everyone enjoyed the cool lake breeze as we cruised along. 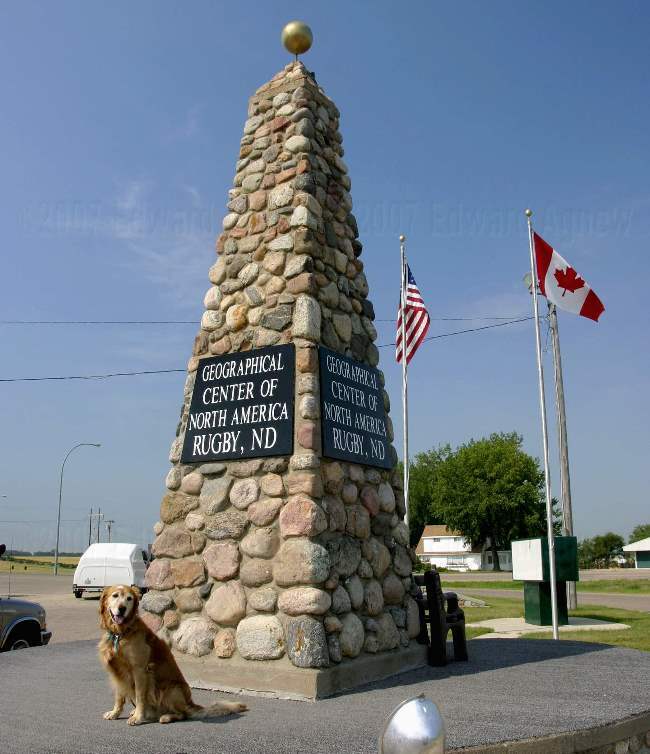 The border is marked by a cut swath following the 49th parallel. The interesting shape of this mountain was made by the passing of several glaciers. One of our fellow passengers spotted this cute black bear on the side of the lake. The captain of the boat brought us in close to shore so we could get a good look at the bear. A view of the lake from Goat Haunt --- that's the cruise boat tide by the dock. From the town site there is a hike to Bertha Falls. Zaph and I admiring the view at a rest stop along the trail. Zaph says "Best Day So Far"
Waterton National Park is quite small compared to it's American half, Glacier National Park but there is still lots to see and do. Basically there is a town site with hotels, cottages, campground, stores, marina, etc., two roads that take you further into the park and lots of hiking trails. Zaph says the best thing about the park is that dogs are allowed on the trails and in the water (there are lots of warnings about safety as dogs may attract wildlife). Today we drove out to Red Rock Canyon, toured the town site and did some short hikes. As it was very hot (mid 30's) we opted to spend some time hanging out at the lake enjoying the cool lake breeze. Red Rock Canyon. The gray rocks in the foreground were carried here by the water. The Prince of Wales Hotel --- another fabulous old hotel. When you walk in and look across the lobby you see an amazing view of Upper Waterton Lake. Zaph and I are outside of the hotel enjoying the view. Zaph saw this chocolate lab swimming and decided to join her. The water was very cold but it did stop the dogs. There were a lot of ground squirrels in the camping area of the town site. Deer roam freely around town. We saw a couple of fawns laying by the front door of one home, others stared at Zaph, decide he was harmless and came down to the water for a drink. Cameron Waterfalls on the edge of the town site. Time to head to Waterton National Park and Alberta, Canada. After a short drive and a fairly easy border crossing we arrived at our home for the next four nights. We decided to take the afternoon off and just hung out at the trailer.